The 2016-built Airbus Helicopters H145 c/n 20085 was seen during the ILA Berlin Air Show 2016 at Berlin-Brandenburg Willy Brandt International Airport with Airbus Helicopters test-registration D-HADP. On 21 December 2015, registration D-HNWS was reserved for this MBB-BK117 D-2. 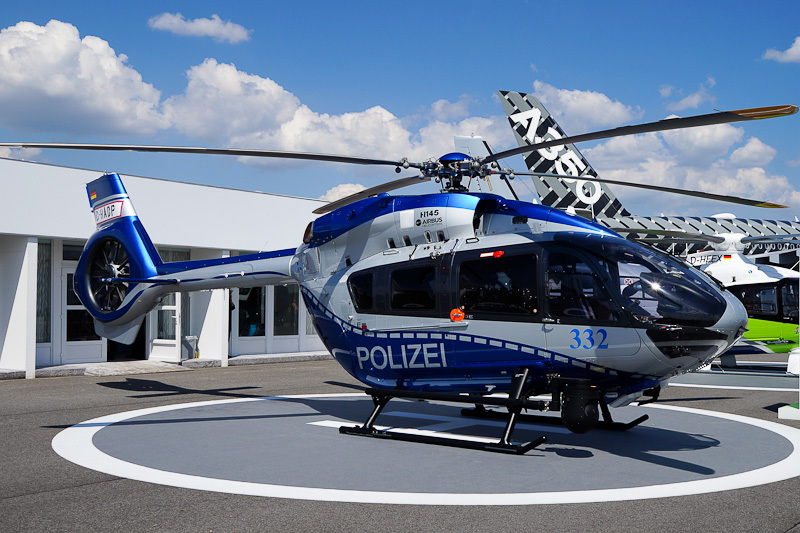 The helicopter is one of six H145 rotorcraft ordered by Germany’s Landespolizei Nordrhein-Westfalen (North Rhine-Westphalia Police Force). In its law enforcement configuration, the EC145 T2 can be equipped with a modern mission management system that facilitates the multi-role capabilities in police missions. Its primary role for observation and surveillance is supported by forward-looking infrared (FLIR) and daylight cameras, controlled by an operator who also handles communications and data exchange with ground-based police resources. On 29 September 2016, the Airbus Helicopters H145 D-HADP was registered D-HNWS with Polizei Nordrhein-Westfalen.